Gritting Companies are closely watching the initial computer simulations, which are predicting a significant El Niño event towards the latter part of 2015. This will be the first time El Niño has occurred since 2009 and is likely to bring a very cold winter, after a cooler and wetter than average summer. 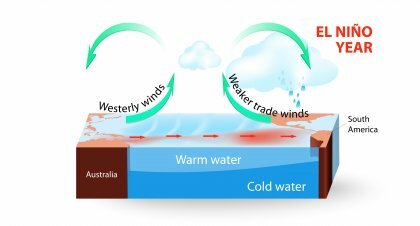 El Niño is widely understood to disturb the climate patterns right around the world and it used to define an upsurge of warmer than normal water in the Equatorial Pacific region. The effects across the globe vary immensely, from flooding on the Western Coasts of America to devastating droughts in North Australia. The consequences of this El Niño for the UK and the rest of Europe are not as clear cut. This makes forecasting and planning for gritting companies much more difficult. However it is believed that, with the current Jet Stream further south than normal, the weather predictions are thought to be even cooler. Studies have suggested that the main effect for the UK, is more likely to be felt during the winter months, causing colder, drier conditions. With the 2009/2010 El Niño, which was the last El Niño to affect us in the UK, the weather across the whole of the UK was extremely cold and therefore we are using this as the warning signs for this winter season. However, there are numerous additional variables which play a part in Europe’s climate, so there is certainly no definitive forecast but it is wise to watch the building effects of this year’s El Niño as they will have the potential to make the headlines.